Remember our last play, Hamlet, and the different versions of the play, with wild variations between the First and Second Quartos, and First Folio? Well, that’s not so much the case here with Troilus and Cressida. There were two Quarto versions, both published in 1609, over five years after the purported writing (and possible first performance) of the play. Here, versions are almost identical, save for a different title page and the addition of a single page that contains a prose preface to the play by the publisher (“A Never Writer to an Ever Reader”). 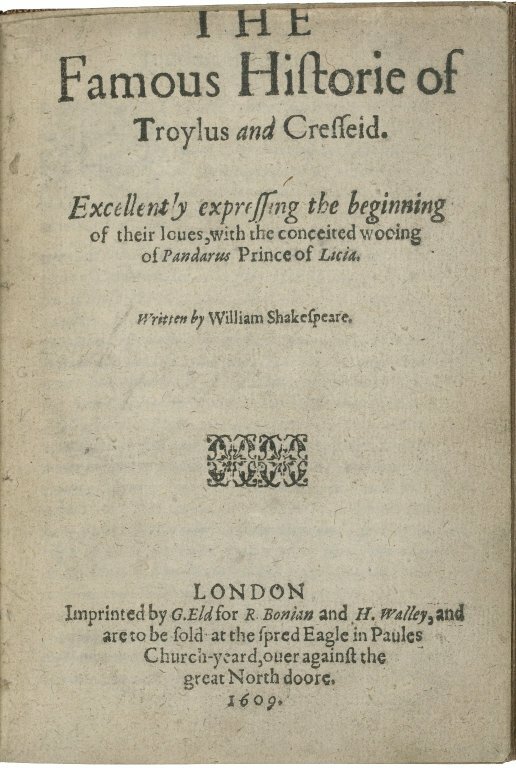 The Second Quarto, also released in 1609, tweaks the title to The Famous Historie of Troylus and Cresseid, and removes the performance notice for the play, while adding the aforementioned prose preface which states that this “new play (was) never staled by the stage” (Preface, 1-2), never publicly performed. When the Folio is published in 1623, the title is now The Tragedie of Troylus and Cressida, the prose preface is gone and replaced by a verse prologue–the one “spoken by a man in armor” (Prologue, opening stage direction). Interestingly, there are a few copies of the First Folio without Troilus and Cressida, and when the play does appear in text, it has no page numbers, and seems shoehorned between the History and Tragedy sections (between The Life of King Henry the Eighth in Histories, and The Tragedy of Coriolanus), but it doesn’t appear in the Table of Contents.